Class members (left to right) Elena Cilli from Italy, Meme Bayardo from Mexico, and Phineas Ellis from Santa Cruz, Calif., help in the construction of a 154-square-foot house Monday on the property of Jesse Shockley just outside of Taylor. 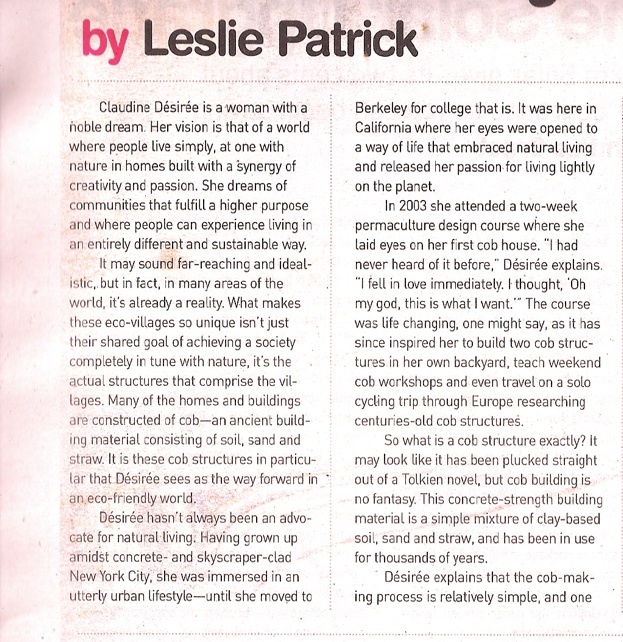 Instructor Claudine Désirée is overseeing the building of this cob-style house that utilizes natural materials. The work is being completed over a four-week period by 15 students from Texas, Mexico, Europe and other areas of the United States. Andy Sharp / For the American-Statesman. The students are taking a workshop to learn how to build out of clay, sand and straw. Taylor man will use cob house they are building as a drafting studio. TAYLOR —Fifteen students from the United States, Mexico and Europe have paid to camp out for a month in a man’s backyard in Taylor to learn an ancient building technique involving clay, sand and straw. 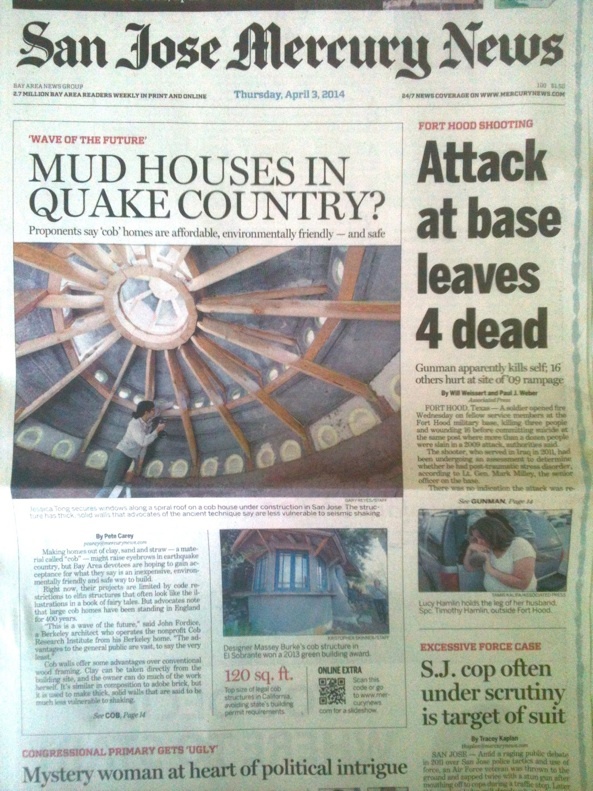 They were busy slapping plaster, which included horse manure, on the walls of the 150-square-foot round house they are constructing at a cost of about $2,000 in supplies for Jesse Shockley one recent warm afternoon. “It’s not just a mud hut. … It’s a work of art,” said Shockley, a sheet metal worker who was busy putting a wood and metal roof on the structure. The house has windows, electrical outlets and relief sculptures of an owl and a tree plastered on its outside walls. Shockley said he’s going to use it as a drafting office for a remodeling business he also has. 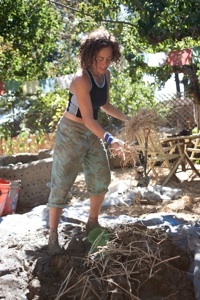 The students are building what is known as a “cob” house, said Claudine Désirée, the 53-year-old Californian who is leading the workshop in Taylor after several years of learning to build the structures. Cob has been used for thousands of years to build houses in Africa, the Middle East, Europe and adobe houses in the southwestern United States. 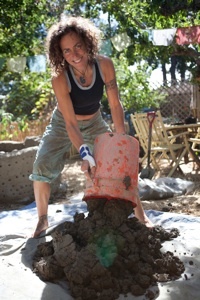 Désirée said she is using a modernized technique of building cob, in which she teaches students how to analyze soil to make sure it has the right mixture of clay, sand and other ingredients to make good building material. The students could not use the soil on Shockley’s property to build because it didn’t have enough clay in it, she said. The students combined clay-based soil they bought from a nearby business with sand and straw mixed with water to build the walls. 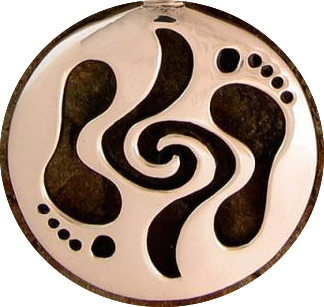 “We build a foot a day, and it dries very quickly,” she said. “It’s earthquake-proof, it’s fireproof, it’s termite-proof and the walls breathe, so there’s no rot, mold or mildew,” she said. The structure also can withstand heavy rains but standing water will soften it, she said. 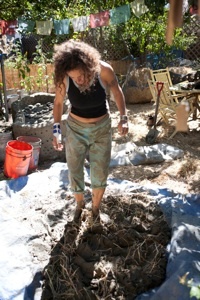 The clay acts as a cement that holds the soil together, Désirée said. 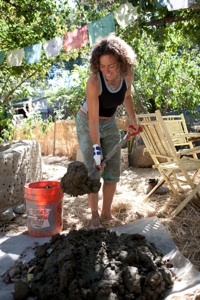 She added that the horse manure, which is treated before students use it to plaster walls, helps make the structure waterproof. Students from as far away as Spain have paid $2,000 to take the workshop. 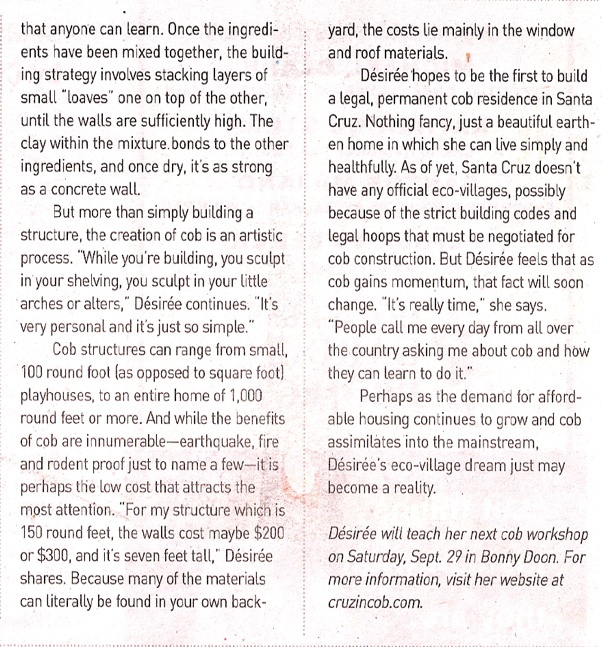 Beatriz Muñoz-Martinez, a 33-year-old from the small town of Catadau, Spain, said she is taking her second workshop with Désirée to learn the art of cob building, so she can teach it to other students. She said she likes working with other people to build a house. “It feels like a family,” Muñoz-Martinez said. Lesley Harrow, 68, said she was taking the workshop to learn how to build her own cob home in Arkansas. “Who doesn’t like to play in the mud?” said 28-year-old Krystal Alexander of St. Louis, another student who was grinning as she spread plaster on the walls. Mick Bartholomew, 23, designed a mandala made of glass bottles that is embedded into one of the house’s walls. He said he just got a degree in industrial design from the University of Rochester and was interested in learning traditional techniques. 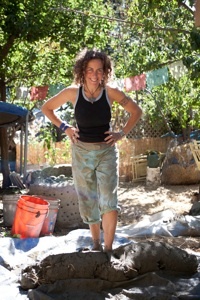 Shockley’s daughter, Jess, said she persuaded him to build the cob house on his property because she wants to learn the technique to build a hostel elsewhere. “It’s all natural, it’s good for the Earth, and you can build it with your own hands,” she said. John Curry and his wife, Kindra Welch, own an Austin natural home-building company called Clay Sand Straw that built a 2,200-square-foot cob house with three bedrooms and two bathrooms in Hays County for customers last year. The house has square rooms, he said. The company also has built a cob house in Hunt with no air conditioning, Curry said. “When the temperature outside is 108 degrees, the interior of the house is 82 degrees,” he said. A cob house takes longer to build than a frame house, he said. It can be cheap to build a cob house if you do it yourself, but builders charge about as much for it as a custom-built home, he said. The houses can last a long time, he said. One cob house in the Clarksville neighborhood in Austin was built in 1882, he said. Living in a cob house is “amazing,” said Désirée, who lived in one she built but who now bicycles around the world giving cob workshops after raising three boys as a single mother.